This year’s winter “will definitely not be normal,” NASA has said. It is, however, awfully familiar. It’s not just the sea surface heights, like those above, that look alike—NOAA and NASA both confirm that they’re also seeing wind patterns and water temperatures that look eerily similar to the ‘97 conditions. Researchers have been noting the budding similarities between 1997’s El Nino and our current conditions since early last year. With El Niño definitely having kicked off now though, it will almost certainly peak this winter. 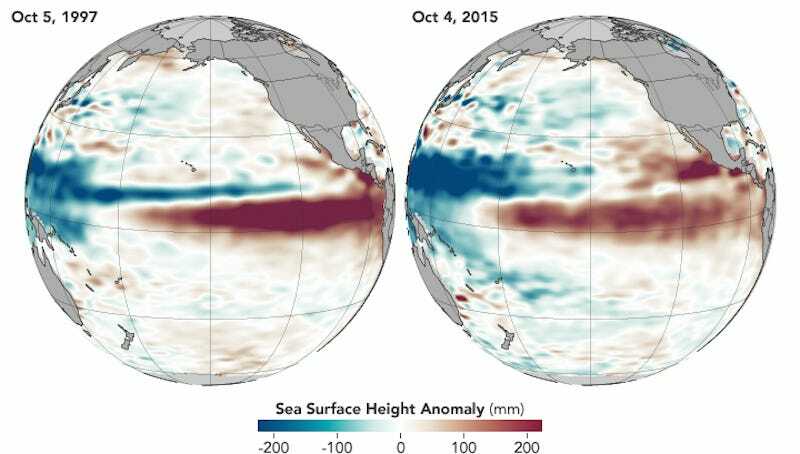 So what did we get last time an El Niño that looked like this hit hard in the winter? 1997-1998 was one of the warmest and wettest winters we’d seen over a century. There were record-breaking levels of snow, sleet, and rain all over the country. There were deadly floods in California, intense ice storms in the East, and a rash of tornadoes in Florida. Exactly what particular cocktail of winter storms El Niño is mixing this year is still unclear—but if history is any guide, it will be a tough one. Top image: NASA Earth Observatory map by Jesse Allen, using Jason-2 and TOPEX/Posideon data provided by Akiko Kayashi and Bill Patzert, NASA/JPL Ocean Surface Topography Team.